Our design places the right plant in the right place while taking into consideration your existing plants. We can handle all of your lawn maintenance needs – everything from mowing and edging to weed-eating and blowing. 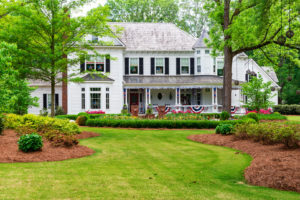 Seasonal landscaping tasks such as the pruning of shrubs, picking up the leaves in the fall, or even just picking up branches after storms make a huge difference in the way your yard looks. Our pros will have your lawn looking great in all seasons. There is something magical about the evening garden. A professionally designed low-voltage landscape lighting brings out the special beauty unique to your landscape at night. For only pennies a day, it safely illuminates the best features of your yard and shapes both the view and the mood. Garden lighting provides both safety and security. Custom night-lighting helps you to see where you are walking at night–illuminating pathways, steps, obstructions, changes in elevation, or anything that could be potentially dangerous. It also strongly discourages intruders by lighting the ground level and eliminating shadows near the house. Custom night-lighting multiplies your opportunities to enjoy your garden and other outdoor living areas. Since most people are working and attending to other responsibilities throughout the day, their leisure time at home is usually after dark. A lighting system allows you to extend the use and pleasure of your garden for entertaining, playing games, or just relaxing. Adding a pond, waterfall, stream or fountain to your landscaping design is a magical combination of rocks, plant textures and liquid motion which you will enjoy all year round. All Seasons Landscaping is the leading builder of ponds, waterfalls, and streams in the greater Shreveport / Bossier City area. Our water features are a little different than others, and we think that’s a good thing! We pride ourselves on building custom water features that consistently exceed our customer’s expectations. We only use the highest quality products to build our natural ecosystem ponds, waterfalls, fountains and streams. The system we install is a revolutionary system that works with nature, not against it. There is no use of toxic chemicals. Our water features are low maintenance and chemical free and are built to meet your design and backyard landscaping needs. We will create a beautiful, low maintenance pond with koi fish, a waterfall, and a stream that you will really enjoy for years to come. A hardscape is any landscape feature constructed out of hard material, be it natural stone or engineered concrete bricks or pavers. Hardscapes add aesthetic appeal, as well as usability and durability to a landscape. Common hardscapes include patios, walls, walkways, stairs, and driveways. We are known for our talent in producing attractive hardscapes that truly capture the customers style and landscape design aspirations. Whether you have full sun or shade, we can suggest the right turf grass for your property. If you’ve got lumps, bumps, or valleys, we can grade your lawn so that it looks great and drains water properly. We review your topography and plan how to manage the runoff from impermeable surfaces, roof leaders, slopes and adjoining properties. We reshape the area as needed to encourage water flow, and install French drains, swales, culverts, and retention and detention areas. While anchor plantings are critical to the balance of your landscape, seasonal color helps define the personality of your home and enhances curb appeal. We have flower bed and perennial garden expertise and can add the dynamic variation you need to complete your landscape. If you have fields or pastures on your property, our bush hogging service will ensure that they always look great.